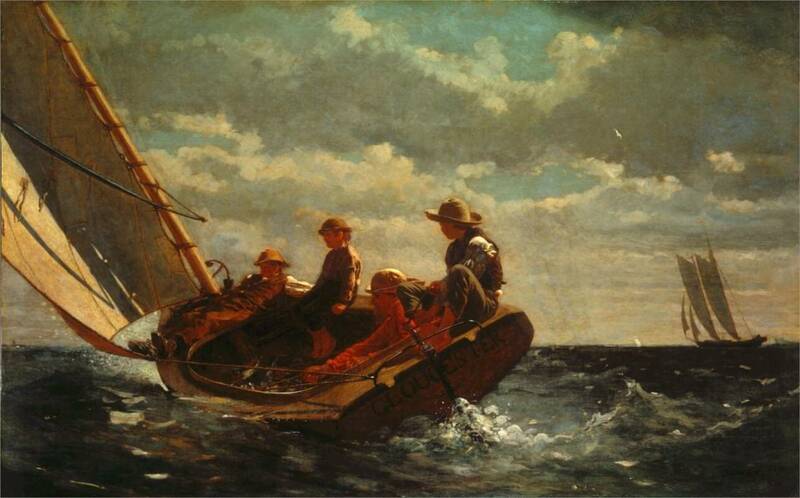 Breezing Up was the capstone of Homer's Gloucester paintings, his most popular painting since Prisoners from the Front, and so compellingly attractive that his critics, as they were seldom at this time willing to do, forgave the coarseness and abbreviation of style that, even here, they could not entirely pass by without comment. Homer began the canvas in New York in 1873, after he had visited Gloucester, Massachusetts, where he first worked in watercolor. He used the sketches made there, of which the most closely related is Sailing the Catboat (1873), for the oil painting, which he worked on over three years. Infrared reflectography has revealed the many changes he made to the composition during this time, including the removal of a fourth boy near the mast and a second schooner in the distance. At one point the adult held both the sheet and the tiller, a position initially adapted from an oil study of 1874 titled The Flirt. The painting's message is positive; despite the choppy waves, the boaters look relaxed. The anchor that replaced the boy in the bow was understood to symbolize hope. The boy holding the tiller looks forward to the horizon, a statement of optimism about his future and that of the young United States. The finished work indicates that the significant influence of Japanese art on Western painters in the 19th century also touched Homer, particularly in the compositional balance between the left (active) and right (sparse) halves. Homer had visited France in 1866 and 1867, and the influence of marine scenes by the impressionists Van Gogh and Claude Monet is apparent as well. Today, Breezing Up is considered an iconic American painting, and among Homer's finest. The National Gallery of Art purchased the work in 1943, described by the institution's web site as "one of the best-known and most beloved artistic images of life in nineteenth-century America."